Russia is a land of riddles wrapped in mysteries. Everywhere from its North to South, East to West. Join us in exploring the largest country on Earth in our new series ‘Russian Life’. We begin our journey near the Arctic circle, on the White Sea archipelago of the Solovetsky Islands – also known as Solovki. This is the holiest site in Russian Christianity, a wonder of medieval architecture and a jewel of nature. How did it become a place of suffering and humiliation for hundreds of thousands? These islands first became sacred grounds thousands of years ago, when ancient peoples of the North festooned the shores with their mysterious boulder labyrinths. “Some archaeologists believe that the stone labyrinths were built for magic rituals related to hunting and fishing; others think they signified the mountains of the dead, a resting place for the souls of the deceased,” explained the Deputy Director for Science at the Solovetsky Museum-Reserve Alexander Martynov. Paganism gave way to Christianity, and in the 15th century Solovki became a domain of the magnificent monastery – a citadel of the Russian Orthodox religion, a military stronghold and the economic, cultural and political centre of the region. The sacred site was believed to be the closest to God’s realm, giving unique power to the prayers of those who stayed on the islands. “The Russians were always attracted by Solovki, and have always sought to make pilgrimages here. 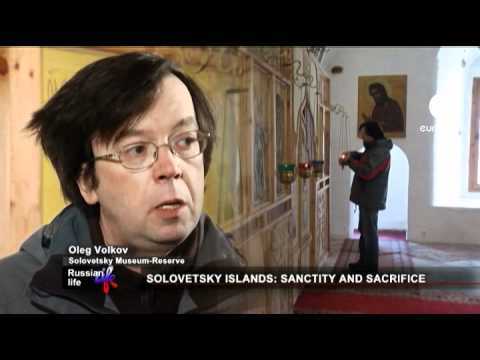 In medieval Russia the belief was that every Russian person had to go to Solovki at least once in their life, and the pilgrimage here pretty much replaced the pilgrimage to the Holy Land,” said Oleg Volkov, the head of the Monastery Heritage Research Department at the Solovetsky Museum-Reserve. The Solovetsky Islands, or Solovki, is an archipelago of six large and over 100 small islands. Ancient artefacts trace local spiritual traditions back to at least the 3rd millennia B.C. The Solovetsky monastery, founded in the 15th century, has long been the main fortress of the Russian North. The Solovki prison camp served as the model for the Gulag system that caused an estimated 1.6 million casualties. Solovki’s history took a darker turn in the 1920s when the Bolshevik revolution desecrated the monastery, turning its cells and churches into prisoners’ barracks. The rising tide of repression processed up to 350,000 people, criminals along with scientists, artists and thinkers, through the slaughterhouse of forced labour. The whole Soviet GULAG prison system was modelled and tested on Solovki. “They found it convenient to place inmates on the islands, to keep them in the frigid northern territories. They sent the most dangerous criminals here – those who acted or could potentially act against the State. That could mean anyone at all. Intelligent people understood what was going on in the country, so they became the most dangerous,” said Olga Bochkaryova, the head of the 20th century history department at Solovetsky Museum-Reserve. Hard labour, disease and mass executions took the lives of 5,000 to 7,000 Solovki prisoners, crippling those lucky enough to serve their complete sentences and make it off the islands alive. “Here lie hundreds, maybe thousands of inmates. All these birch trees, all these buildings rise over the mass graves,” adds Bochkaryova. In 1939, the labour camp was shut down and scrapped. Today the complex heritage and natural beauty of Solovetsky Islands provides a livelihood for almost 1,000 local residents, attracting tourists and pilgrims from all over the world. “Any Russian, just like any other person coming here, can stop for meditation and try to answer the most important question of all: what am I living for, and what do I need to do to make my life right?” said the Superior of the Holy Transfiguration Solovki Monastery Archimandrite Porphyry. With the historical monastery revival, the Solovki are reverting to their original selves. Still, every Easter celebration here painfully recalls the tragic story of death and resurrection in Russia’s Holy land. From the northern islands we will move to the southern mountains: for generations the Urals have been Russia’s industrial backbone. Today they are revealing a new identity as a place of ancient heritage and modern recreation. That is in the next episode of ‘Russian Life’. It took nine days in unheated train carriages for the first Soviet prisoners to get from Moscow to Solovki – the infamous forced labour camp on the Solovetsky Islands, a small archipelago isolated from mainland Russia in the cold White Sea. We are much luckier, only having to take two short plane flights, connecting in Archangel, one of the main cities in the Russian North. The camp ceased to exist at the beginning of World War II. Today the Solovki are slowly recovering their former glory as the spiritual centre of Orthodox Christianity, a kind of national Holy land, the site of pilgrimages for orthodox believers and those interested in Soviet history alike. The contrast between Christian values of tolerance and forgiveness and the historical realities of this place is striking. Long before the Bolshevik revolution that brought down the Russian monarchy and quickly collapsed into the civil war, totalitarian rule and massive repressions, the sacred monastery castle on the main Solovetsky island was a prison for enemies of the state and the church. Some people were sent to exile in Solovki. It is a sunny day at the end of April when our small airplane touches down on the iron-paved landing strip right next to Solovetsky Monastery. It is Easter eve, but here, about 160 kilometres from the Arctic Circle, it still feels like the European winter; about zero degrees Celsius, probably not the best time to come to Solovki. The ice between the six main islands of the archipelago has started to melt, so there are no ways to cross it until end of May. Everybody has left all the islands, except the main one that has the tiny airport; the smaller ones will remain unreachable for several weeks. Come June, sea navigation will open, bringing to Solovki crowds of tourists and pilgrims from all over Russia, together with people from Finland, Western Europe, the USA and other foreigners attracted by the legendary beauty of this place. Its excursion routes are quite well-designed; they combine boat trips along the monk-made canals with visits to holy places and the sites of Gulag-era mass executions, which are often the same. The summer months provide the annual revenues for the small local population of less than 1,000, many of them children and the elderly, with almost all working adults employed by the museum. In the low season, life on Solovki slows down. As one local told us, the men spend the winters ice-fishing, drinking, or drinking while ice-fishing, while their wives kill time paying each other visits. There are no theatres or restaurants in which to spend the long northern nights, and if anybody is unlucky enough to have toothache, they have to fly to Archangel to see a dentist. The beautiful monastery with its onion-shaped wooden domes, typical of the unique northern Russian architecture, is a dominant landmark of the main island. Most of its churches and other buildings are now being restored, some of them very impressive even for a modern visitor. The site has quite an unusual status of being both a functioning monastery with a brotherhood of about 100 monks and a state museum, with the same person in the dual role of monastery father superior and museum director. This is an interesting phenomenon in Russia, where the church and museums do not always get along well in their disputes over historical estates and cultural artifacts. However, as one of the museum employees told me, the abbot director is actually very supportive of historical and archaeological research on the archipelago, even more so than some of his secular predecessors. A permanent exhibition of Gulag-era documents, photos and some recovered work tools has been recently opened in one of the barracks that housed prisoners of the Soviet labour camp, just outside of the monastery walls. There is not much left after the immense political prison was shut down and thoroughly scrapped in 1939. Still, the declassified orders, personal letters and other collected papers reveal the facts of industrialised violence and humiliation that killed or crippled tens of thousands of people, among them the best minds and talents of their generation. Many of them lie buried in unmarked mass graves, yet to be counted and identified. We left Solovki with mixed feelings of amazement and sadness, hoping to return here sometime in July – when sparkling streams will carry boats through the blooming forests of Russia’s holy land.